CMP Products Conqueror cable cleats are metallic cable cleats which have been designed, constructed, and tested in accordance with the International Standard ‘cable cleats for Electrical Installations’ IEC 61914:2009. The Conqueror cable cleat has been designed to restrain a large cable range take, and tested for exceptionally high short circuit conditions on cables held in trefoil application / formation, to ensure the securing and retention of cables without damage. Conqueror is unique with its patent pending adjustable hinge. The movement of this hinge virtually doubles the range take adjustment when compared to other fixed hinged products on the market. 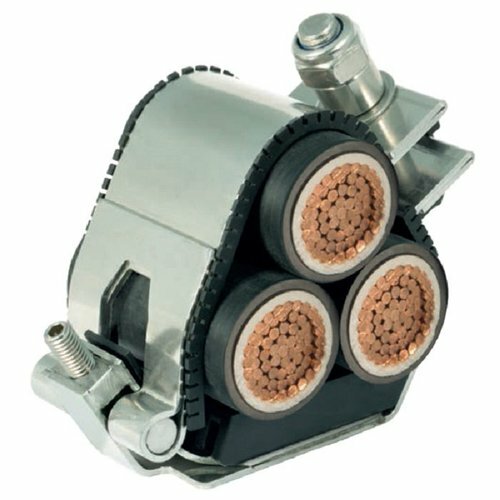 Conqueror covers a range of cable diameters from 19mm up to 130mm in only 16 sizes. The cable cleat is fabricated from 316L stainless steel, giving it high creep strength whilst providing excellent corrosion resistance in the harshest of environments.